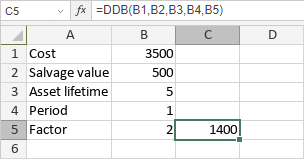 The DDB function is one of the financial functions. It is used to calculate the depreciation of an asset for a specified accounting period using the double-declining balance method. period is the period you wish to calculate depreciation for. The value must be expressed in the same units as life. factor is the rate at which the balance declines. It is an optional argument. If it is omitted, the function will assume factor to be 2. Note: all the values must be positive numbers.